This is a set of seven separate dies wired together, they can be separated by snipping the wires. The bike measures 2.375 x 3.75 inches and the smaller pieces are around .75 x 1 inch. It coordinates with CL255 Riding Pretty clear set. Designed by Alesa Baker Designs. These dies are compatible with most tabletop die cut machines. 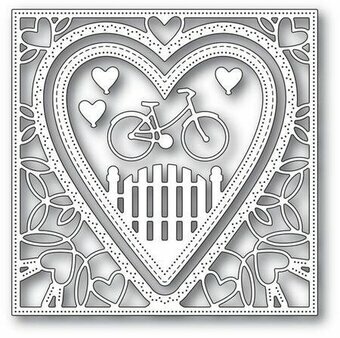 Create whimsical wall art with this bike embossing folder. It works with most embossing machines and the fun flower-and-basket motif and your heavyweight card stock let you make garden-themed paper crafts. Folder: 4.25 x 5.75 inches. Bicycle: 2.1875 x 3.5625 inches. Penny Black Craft Die featuring a Bicycle. Impression Obsession craft die featuring a bicycle. This is a set of 4 dies. The assembled bike measure 3 x 4-3/4 inches. These are US-made steel dies compatible with most table-top die cutting machines. Love to cycle? Our bicycle-patterned embossing folders are lined with tandem and single rider bikes to give papercrafts an adventurous background in seconds. Use this embossing folder to create detailed designs on wall art, greeting cards and more. 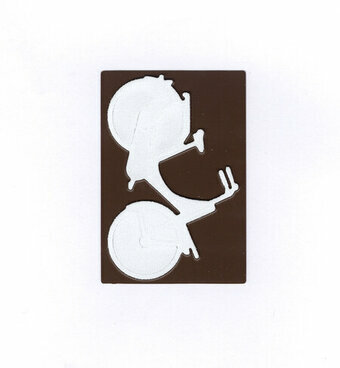 Bicycle background embossing folder. Vertical or horizontal orientation. Works best with heavyweight cardstock. Fits most embossing machines. Folder measures 4.25 x 5.75 inches. 1 embossing folder per package. Joy Crafts paper craft die featuring a bicycle. 1 die. Size: 2.56" x 1.77". Craft Die featuring a bicycle. 2" x 3.3". Spring is made for bicycle rides in the park. This die measures 2.625" x 1.625". This bicycle die is great for Summer or travel themed projects. The bike has a slightly vintage look, which makes it great for retro projects as well. Includes 1 die. Size: 3.5" x 2.25". Shapeabilities Lavender Trike Etched Dies is a sweet design of a tricycle carrying basket full of lovely lavender blooms. Spellbinders Shapeabilities cut, deboss, emboss and stencil with a single etched die template. Approximate Size: Lavender Trike: 3.00 x 4.20 in. 7.50 x 10.60 cm. 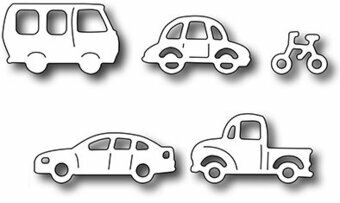 This fun set of 7 small transportation dies includes a car (0.8" x 0.375"), a bicycle (1" x 0.625"), a luxury sedan (1.125" x 0.375"), a bus (1.25" x 0.6"), a camping trailer (1.5" x 0.6"), a semi truck (1.75" x 0.875") and an airplane (1.75" x 0.75"). Designed to work in conjunction with our other travel dies. For example, you can fly the plane over the San Francisco Cityscape skyline (FRA9516), or show a car traveling across the USA on the map die (FRA9517). Lots of fun possibilities with this die set! Momenta-Little Yellow Bicycle Vellum Stickers: Travel. A fun and unique addition to all your scrapbooks, cards and more! 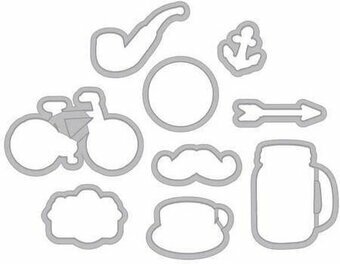 This package contains eight vellum stickers on one 12x5-1/2 inch backing sheet. Acid and lignin free. Imported. The dies in our "Village" collection are designed to work together to form scenes for cards or scrapbook pages. Mix and match the different components, add some of our larger trees, and don't forget to create hills with our Stitched Scene Builder Edgers (FRA9403). Let your imagination run wild! The Village Wheels set consists of 5 vehicles. Bicycle: 0.4" x 0.375"; Pick-Up Truck: 1" x 0.6"; Van: 0.9" x 0.6"; Sporty Car: 1.125" x 0.4"; Compact car: 0.875" x 0.45". Frantic Stamper Precision Dies are made in the USA. Compatible with all leading consumer die cutting machines.